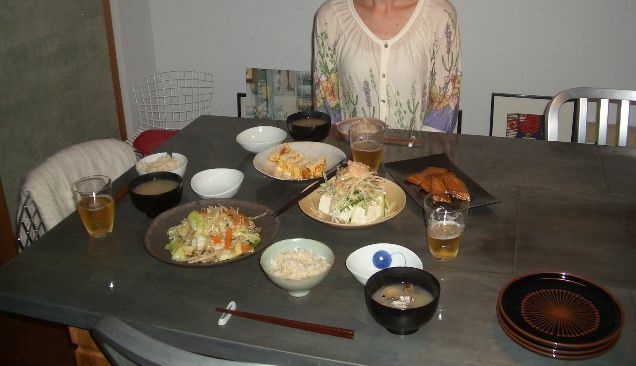 in japan, when i tell people that my husband is dutch, people always ask me what a typical dutch dish is (japanese people in general have a high interest in culinary subjects. food can be a central topic of a conversation with strangers). i always stumble over my answer to this question, so does my husband actually. he always says “oh we eat potatoes, meat and veggies, meatballs, french fries, herrings, white asparagus, rabbit or venison for chirstmas…” a funny thing however is that he never comes up with a name of a particular dish for some reason. not sure if this dish is dutch dutch, but “kip in zoetzure saus,” sweet & sour chicken, happens to be my favorite dish which i have ever eaten in holland. the first time i went to visit his parents there, his mum cooked this dish for us, because of my cravings for rice after staying in holland for a week or so. the recipe appears to be influenced by indonesian food. the sauce is made with 1/2 chopped onion simmered in oil (3 tb spoons), 1 tb spoon of “ketjap” (indonesian soy sauce – but i use soy sauce instead), curry powder (i use garam masara), vinegar (1 tb spoon), sugar (2 tb spoons), tomato sauce (i use 10 – 15 cherry tomatoes instead) and 5 tb spoons of pineapple flavoured curry cream (you can get it in a grocery store in holland. its consistency is very similar to yogurt, but sweater in taste). after the sauce is ready, put 200g – 300g of chicken breast, lightly fried earlier in olive oil and with white wine, and simmer altogether in low heat for 10 minutes or so. add salt & pepper to taste (but not too much salt). served with brown rice. the salad is also his mum’s recipe – endive salad with chive dressing. very refreshing. Comments: 2 Posted by: Small Tokyo Kitchen Categories: dutch? many people abroad seem to think that we japanese eat sushi at home. the kind of sushi with a thin slice of fish flesh and a small rice ball underneath. in fact though, we don’t really eat those at home. it requires a high level of skill to which we usually depend on professionals. 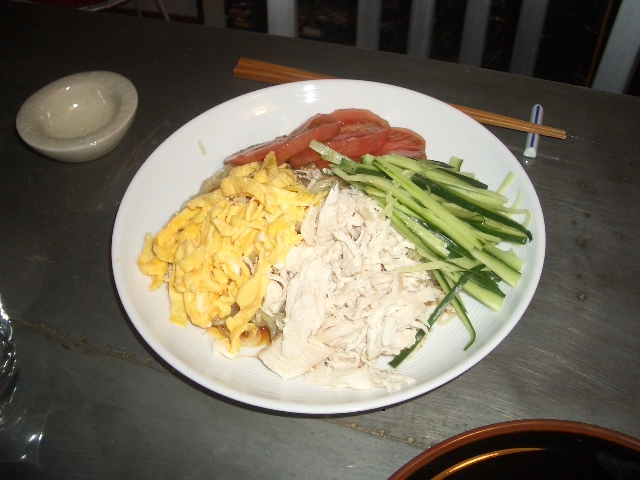 an alternative solution for sushi-esque dish for home is this type of 丼 “don” dish with raw fish on top. “don” dish is usually a ball of rice with main course & side dish altogether on top as topping. topping can be anything, doesn’t necessarily have to be raw fish only. it can be tenpura, chicken & egg, beef stew, etc. it is a very practical & efficient dish. anyway, today’s topping is negi-toro, fatty tuna tartar mixed with leek (negi) chops, along with a few slices of flounder sashimi, decorated on japanese “shiso” basil leaves. as its sauce, i used soy sauce, mixed with grated wasabi & a tiny bit of grated ginger. for my portion of negi-toro don, one more ingredient was added – my favorite food called “natto”, fermented soy beans, which makes a perfect resonance with other ingredients (so i believe). after living more than 10 years in Japan, my Dutch husband still refuses to eat it, claiming it’s because of the smell. but to be honest i think the smell of cheese is much stronger and unbearable. with tofu salad as an extra dish. 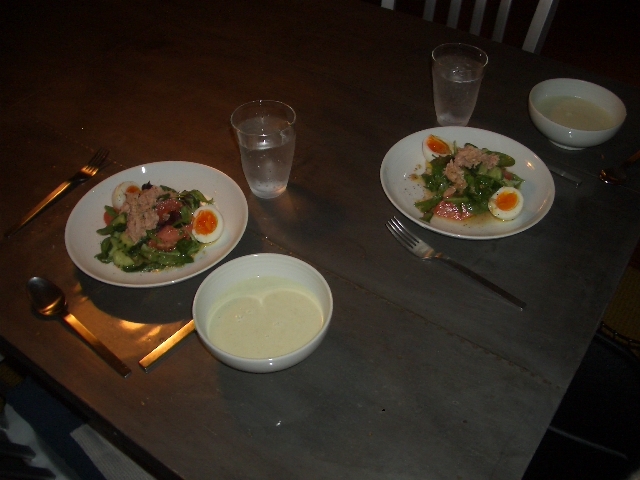 one evening, my husband brought a surprise guest from Holland, a very good friend of ours who used to live in tokyo. i was in the middle of cooking when they arrived home, and had absolutely no idea that he would bring someone along. he had tried to call, but my phone was in the other room. typical – a moment of panic, but hey, the more, the merrier! 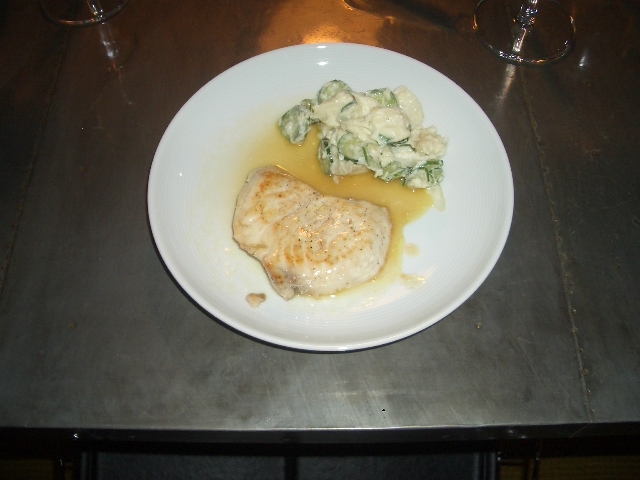 that evening, i was simmering sword fish filet in soy base sauce (soy sauce 2: sake 0.5: mirin sauce 4 and a couple of slices of ginger), and making “hiyayakko”, fresh tofu with some herb garnish on top. ok, now that we had 1 more person at our dinner table, i quickly made vegetable stir fries with bean sprouts, carrots and cabbage, and cooked an egg roll with “shirasu”, whitebait fish inside. 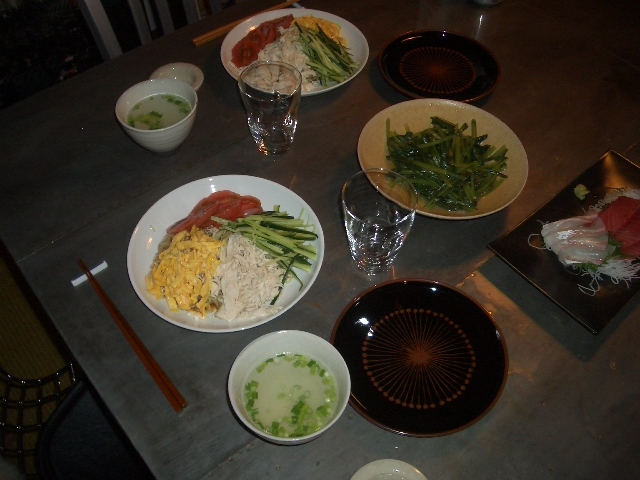 as is always the case, there were a bowl of rice and a cup of miso soup (with clams for the night) for each person. one sunday morning we woke up around 10am, and it was probably the first sunday in a few months when we had no appointments or particular plans. great, time for a nice long lazy brunch. peach is one of my favorite fruits. 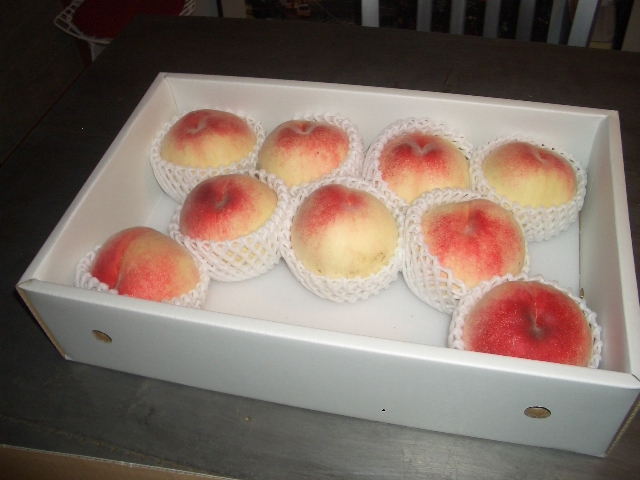 we received this nice box of peaches from a very good friend of mine in osaka. these peaches are from a place called wakayama, a prefecture right next to osaka, west region of honshu island. once again it is so hot in tokyo, and we wanted something cold, fresh & juicy. 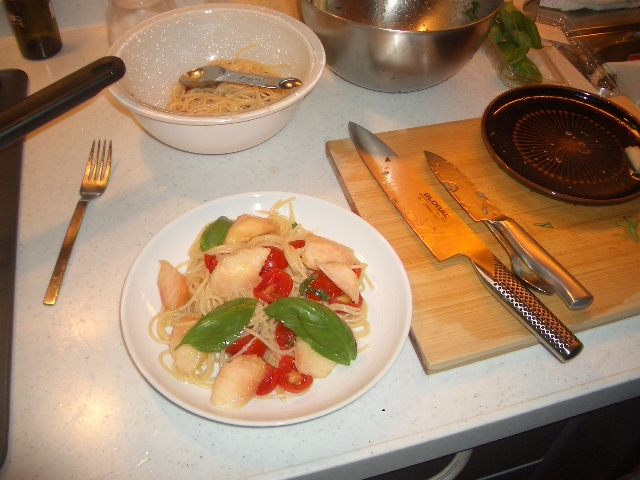 “spaghettini con pomodorini e pesca” is a perfect solution for the occasion. influenced by the dish we once had at a restaurant called Dal Matto (www.dal-matto.com) near our flat. the spaghettini are washed in cold water after being boiled, mixed with extra virgin olive oil and cherry tomatoes. this time i used basil to give some kick to the composition. for the main course, i made sword fish (lemon butter sauce) with potato salad on the side (leftover from the night before). 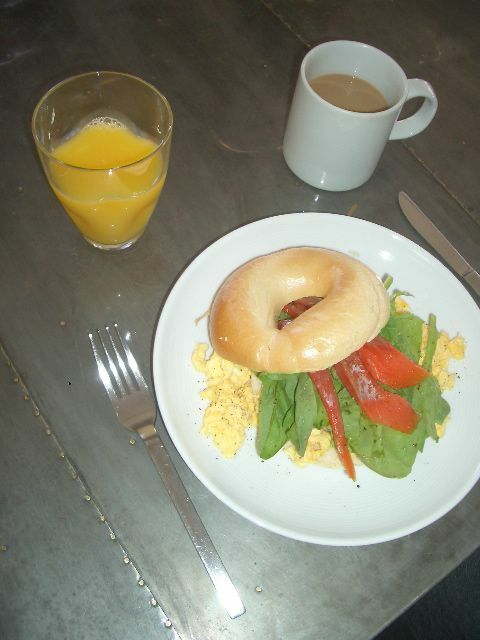 this is a dinner from about a week ago, following a quite a big brunch during the day with friends. we decided to go healthy for dinner, hence the salad & bean soup. I always make vinaigrette on my own – this time, i used regular salad oil, red wine vinegar, onion and a hint of balsamico. this time i used a can of tuna instead of fresh tuna (didn’t have time to shop). the soup is made of fresh fava beans, boiled and then simmered with chopped onion in extra virgin olive oil, mixed with cold milk afterwards, salt & pepper to taste. so simple but quite tasty. i didn’t use bouillon at all, but this way, the taste of fava beans seem to have stood out.